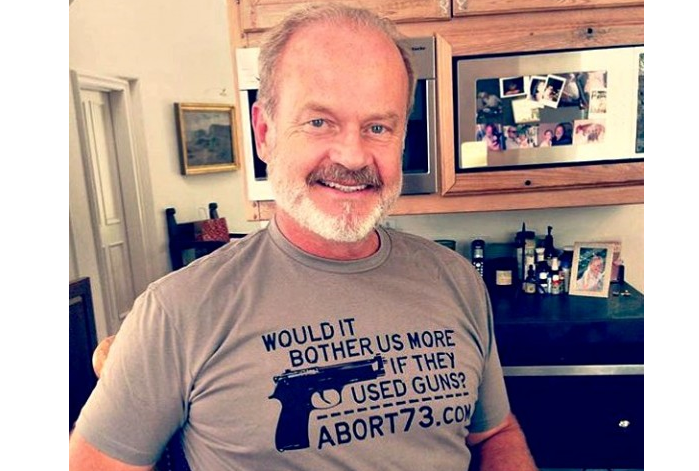 Whether or not there’s any truth to that will most likely forever remain a mystery, but it certainly doesn’t seem to have prevented the actor from continuing to express his beliefs, as seen in this recent Instagram post:In this photo, posted to Grammer’s wife’s Instagram on Wednesday, the five-time Emmy winner is seen wearing a pro-life shirt that reads:Would it bother us more if they used guns? http://www.Abort73.com, which is “an online resource designed to creatively and comprehensively educate students about the injustice of abortion,” is a part of Christian, non-profit Loxafamosity Ministries. Not only does the shirt make a clear statement in regard to abortion and the controversial Planned Parenthood videos, but also ties in the topic of recent gun-related tragedies. @yaeltime YOU WILL LITERALLY NEVER EXPERIENCE ANY OF THIS. WHY DO YOU FEEL THAT YOUR INPUT IS IMPORTANT. @HuffPostEnt Not bizarre. Says maybe if a gun was used to kill babies during abortion, proponents would finally get upset..
Gene Simmons Daughter Wants All Of Us To See All Of Her!